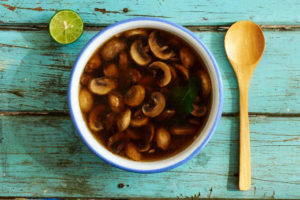 A simple mushroom soup prepared with epazote which gives it its uniquely Mexican taste. This is another recipe that our photographer Andres’ mother used to cook for him when he was a kid growing up in Cuernavaca. Real Mexican home cooking. 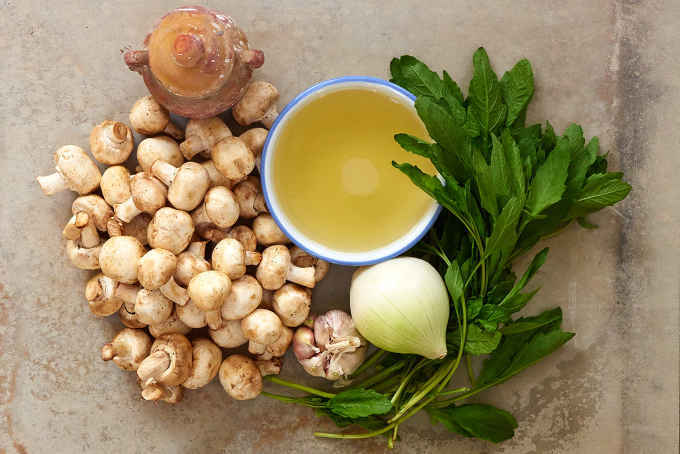 You’ll need button mushrooms, white onion, garlic, epazote and chicken broth. Substitute vegetable broth for the chicken broth to make it a vegan / vegetarian soup. Start by removing the stems from the mushrooms then discard the stems. Slice the mushroom caps into 3 pieces. 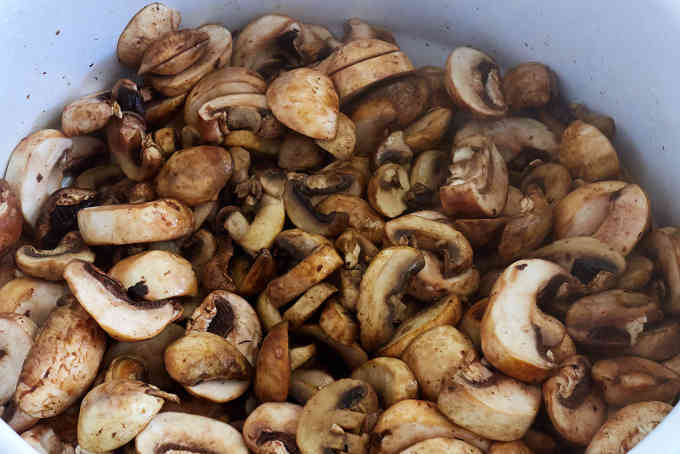 Heat the oil to medium hot and then add the sliced mushrooms. 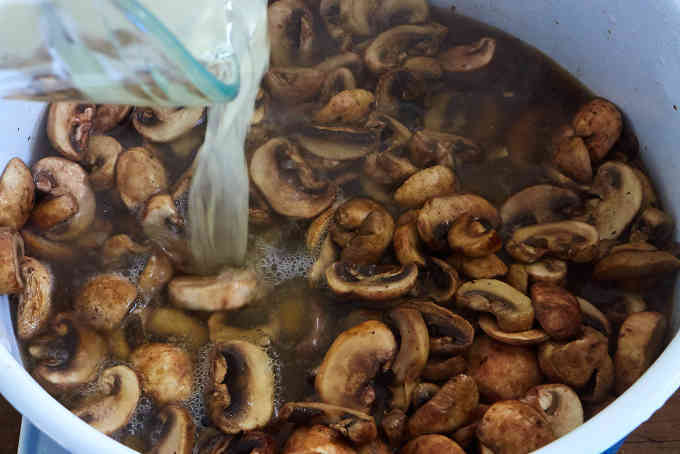 Cook, stirring every 30 seconds until the mushrooms start to darken in color and start to release their liquid. Add the blended onion and garlic and the remaining chicken broth. Add the epazote and boil for 5 minutes then cover. Reduce the heat and cook for 10 more minutes. 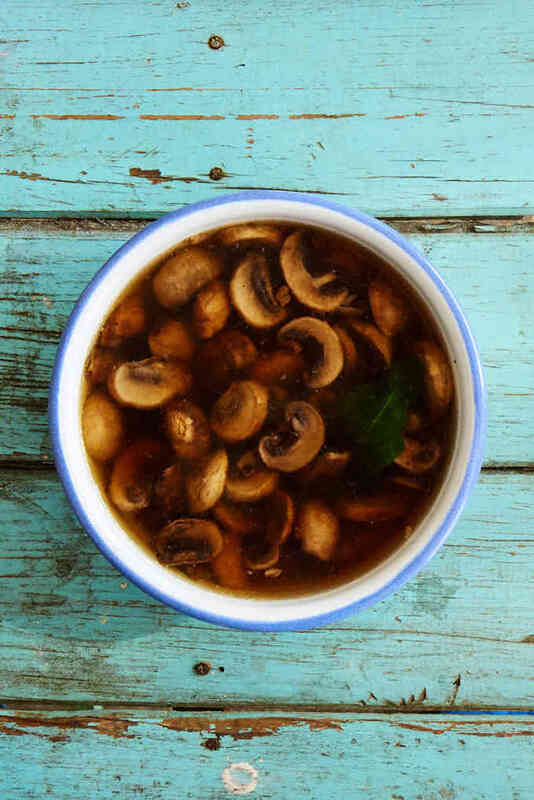 There you have it, a healthy easy to make mushroom soup that comes from the heart of Mexico. Serve each bowl with a couple of lime halves. Let us know how it turns out for you. We think you will love it. It will become a weekday favorite. 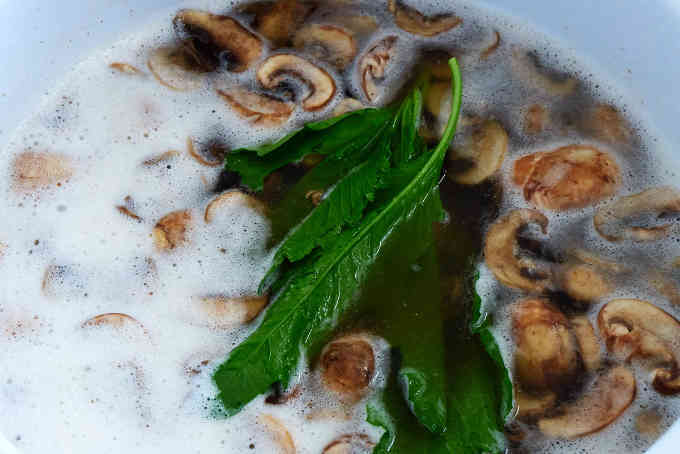 A quick and easy mushroom soup which gets its uniquely Mexican flavor from epazote, a pungent herb used in Mexican cooking. One of the many recipes that our photographer Andres' mother used to cook for him when he was a kid growing up in Cuernavaca. In Spanish the soup is called sopa de hongos o sopa de champiñon. For a vegetarian / vegan soup you can substitute water or vegetable broth for the chicken broth. A very healthy soup with or without the chicken broth. I made a vegan version using bean broth as the liquid, and oregano instead of epazote.. Hard to imagine such big flavor came from such simple ingredients. Thanks! What a great recommendation! We will try it with bean broth the next time we make it. Cheers!